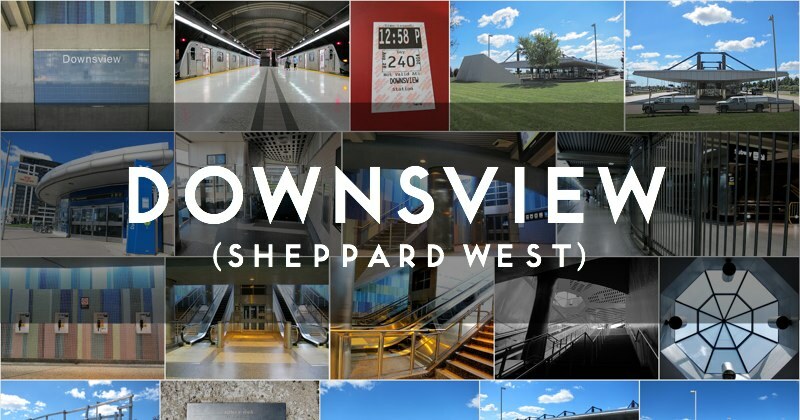 Downsview is a sprawling transit palace. And I mean that in a good way. Criticized after its opening in 1996 for its supposed opulence in the middle of nowhere, Downsview served for over two decades as the terminus of the Spadina line. Inspired by the aviation heritage of De Havilland and Downsview airfield, the high-ceilinged subway platform level was designed by The Stevens Group Architects and evokes an aircraft hangar, while Adamson Associates Architects were responsible for the mezzanine and above grade structures. Even when busy, the station’s vast modern spaces provide ample room for passengers to breathe and meander. The grand bus transfer hall is the most spectacular of any TTC station built before 2017. Where Scarborough Centre is likely the nadir of TTC subway station bus platforms (some might argue for the pre-demolition Victoria Park), Downsview must represent its zenith. I’ve often had the chance to reflect on the hall’s expansiveness when taking the 85 or the 101 out to Downsview Park. It feels like a genuine transit hub. The station features two artistic installations. The seductive tile mosaic of Arlene Stamp’s Sliding Pi covers the concourse wall surfaces with its soothing blue and green influence. Although observers might initially mistake it for a simple tiling pattern, on closer inspection the mosaic is non-repeating and mathematically generated, based on the digits of pi. It was an extremely clever way to enliven the facility while remaining within a constrained budget. There is no doubt in my mind that Stamp’s design is integral to the atmospheric success of Downsview station. Stairwell to Passenger Pick Up, or Space Station? Downsview was named for John Perkins Bull’s 1844 farm, “Downs View”. The Downs View structure was used by Bull for religious services and a courthouse (the jail was located in the cellar). The Downsview name was selected in a 1994 TTC contest involving the local North York community. All things considered, Downsview station is a muscular statement, the pent-up outburst of almost a decade without subway construction in Toronto. Naysayers may have derided it as an excess of civic ambition and over-expenditure, but sometimes, it’s better to simply shut up and enjoy the architecture. The opening ceremony for Downsview was held on March 29, 1996, and featured a train bursting through a banner, plus a 180-child choir.